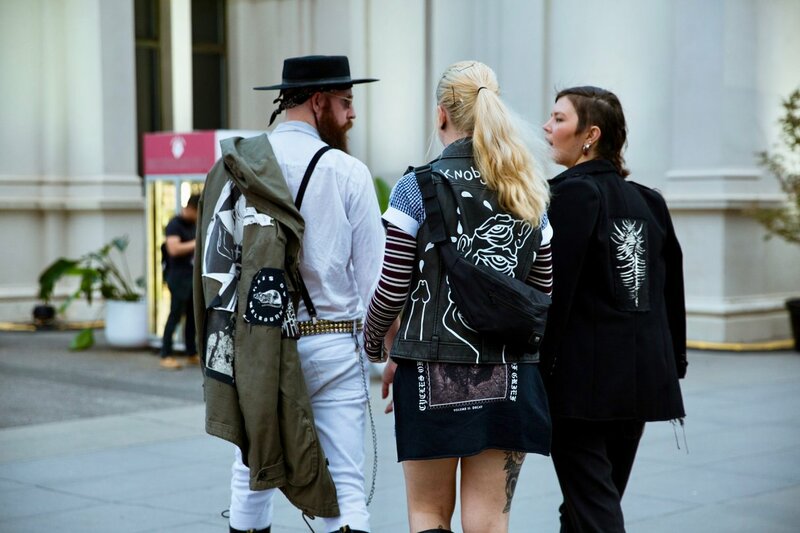 You could be excused this year for failing to pick the biggest fashion trends and styling for both men and women from the street style scene at VAMFF. We’re not sure there was one. For the first time in years, individuality reigned supreme, brought about by attention to detail through accessories. Colour blocking has returned. There were more bike shorts than we expected to see, but not enough to say they dominated. They did not. Suiting is one fashion trend for women that’s definitely on the rise, although it’s taking so many different forms. Combined with everything from bike shorts (for both men and women) and culottes, to pants and minis in plaid, block colours, ginghams and satins. Ruffles are still around but layering is not. Shimmer, it seems, is still big for all genders. Sequin dresses and men’s blazers turned heads, along with metallic fabrics and satin suits. Not forgetting shiny patent leather loafers. All manner of accessories ensured no single fashion trend dominated, from extra long earings, snake skin print fabrics to the widest assortment of head-turning footwear we’ve ever seen en masse. In a fashion festival that’s paid more attention to diversity than ever before, the street style looks and diverse fashion trends around the plaza this year proved a match. Here are more of the fashion trends that turned our heads during the week, from the lens of Zoe Kostopoulos.